Wiener Dog VW Camper Longs for Your $5,800! Frequently, those of diminished mental faculties are derisively referred to as riding the short bus. Nice Price or Crack Pipe isn't that mean, but if that aphorism is true, we've got a VW that'll make you a Mensa member. Despite an 80% Nice Price vote, change purses stayed tightly shut yesterday, denying the hyper-ducted 2006 Saleen S7 a rightful Jalop owner. As it's Friday, and we've had a week of oddball candidates - from an alien Aveo, to the World's Most Expensive Yugo, we might as well go out with something equally strange- a double-your-pleasure VW bus. Offered up with but a lone, grainy photo, this 1971 VW camper has had things done to it, much in the way Poland had things done to it during WWII. This red bus is offered at $5,800, and for that asking price you get a whole lotta' rosie. Stretched to 19 feet - 3 inches longer than the concurrent Cadillac Sedan De Ville - and on a longer wheelbase, the ability to turn this thing around must rank right up there with the QM2 and Viet Nam war. Not that you'll need to turn back, as this is a camper that's built to pamper- with stove, 110V electrics, A/C, and a crapper for those times on the road when you're not feeling summer fresh. Now, the standard VW flat four pushes the brick-like bus down the road like a high-fiber meal through your digestive tract, and with similar sounds emitted from the back end. 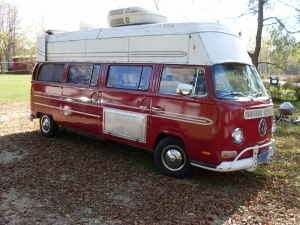 The builder of this über-bus realized the added weight from the conversion would only make the camper a creeper, and replaced the pancake four with a Chevy 2.8 V6. That added torque should help provide it with a little more camp fire. Now, some folks will say that size doesn't matter- that it's the driver that will enliven her. Or that really, it's not the length, but the roundth that makes for a happy camper- but we beg to differ. Arriving in a VW that has the size and gravitas of a limo will make an impression on pretty much anyone. And lest you think that this is the physical manifestation of some lone, mentally deranged - but talented craftsman - here's another one as proof that it's not an isolated incident. So, if you were looking for a place to call home, but that doesn't cramp your wanderlust, this VW may just fit the bill. But what about that $5,800? That's a lot of nights at KOA. Does that price put this long bus on your short list? Or, does that make it a bus stop? Madison Craigslist or go here if the ad disappears. Hat tip to the ever reliable tempesjoe!